We’re loving these Moda Contemporary letterpress wedding invitations. Printed in a combination of our pewter and sand inks, the softer color palette is the perfect pairing to the jute colored pocketfold. This particular couple actually chose our smaller square size card (SQ6) to be adhered to the pocketfold, as they liked the idea of the pocketfold creating more of a framed look. We thank our friends over at Urbanic Paper Boutique for sending over these beauties! Another beautiful run of Ian Koenig‘s La Salle design we printed recently for our friends over at Urbanic Paper Boutique. Love this design in general, and it works really well as a square (the original design‘s shown as a rectangle). This kind of thing (going from rectangle to square) is just one of many customizations we can make to any design for no extra charge. Have your own custom artwork that you’d like letterpressed? Send it on over! These invites feature a custom design that was sent to us by the awesome crew over at Urbanic Paper Boutique. They’re printed in a subtle blend of Pewter, Charcoal, and Black inks, and also feature a custom envelope liner that we created in-house based on the original design. 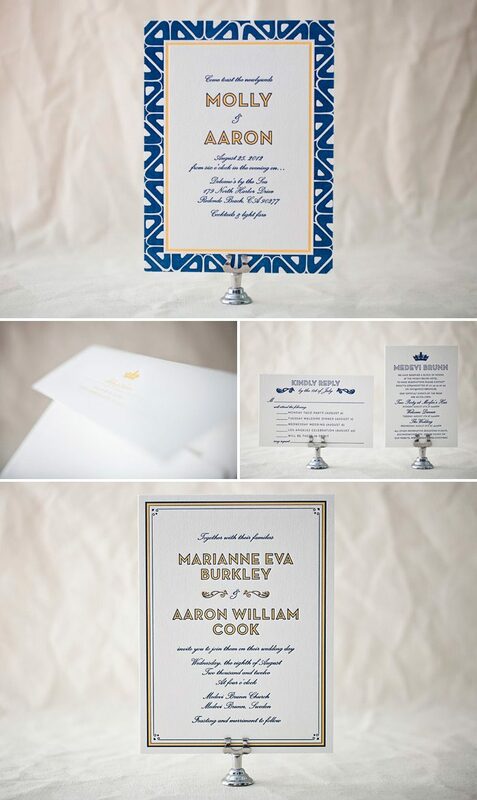 The couple wanted to do a double-sided design because they are having two events — the wedding ceremony & celebration in Sweden, and then a reception back here in California. They knew not everyone would be able to attend both, but still wanted them to know they were included! Since the wedding is in Sweden, there was no question on the use of blue and yellow, along with the crown motif, to pay homage to the country’s history. For the front side (the formal ceremony) they wanted something classic but not too old-fashioned. When they saw True Vintage they knew it was the one! They came to Urbanic knowing they wanted to include the Byzantine border on the backside to add something a little more fun and “beachy” for the California party. We think the combo came out great! We couldn’t agree more! We loved the way the designs worked together (both original designs were created by Ellie Snow) and the pairing of our navy and champagne inks created a distinct look with a rich, royal feel. The crown motif was repeated on the information card and on the envelopes, and matched the look of both designs perfectly! Kudos to Urbanic for creating such a fabulous customization, and best wishes to Molly and Aaron for their upcoming wedding! This design won an honorable mention in our Bella Figura design competition for 2012. This annual competition recognizes outstanding and inspired designs submitted to us by our beloved dealers. 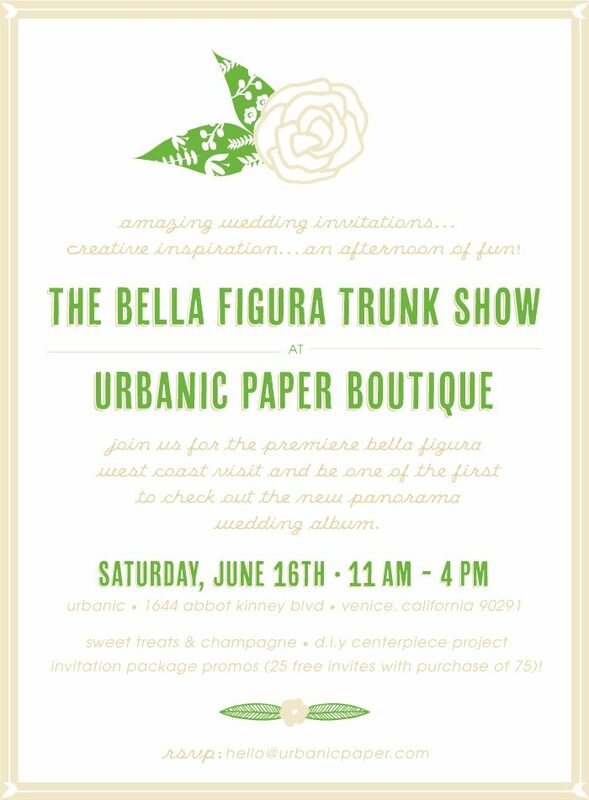 Bella Figura + Urbanic Trunk Show! We couldn’t be more excited to announce that we’re heading to California next week to host a trunk show with Urbanic, one of our favorite Bella Figura retailers! Come in to Urbanic on June 16 for an afternoon of dazzling inspiration, sweet treats & bubbly, and lots of fun! You’ll have the chance to sit down with stationery experts from Bella Figura + Urbanic and view the new Panorama wedding album (which is filled with stunning foil-stamped and letterpress invitation designs!). You can even learn how to make your own DIY centerpieces! And the best part? Come in for the trunk show to order a set of invitations, and you’ll get 25 free invitation sets when you order 75 or more! That includes everything – invitations, reply cards, insert cards, embellishments – the works! The trunk show runs from 11am-4pm, so if you’ll be in the area, RSVP to hello@urbanic.com today. We hope to see you there!